Why not use my insurance company’s Adjuster? Can I still file a claim after I’ve been paid and my insurance company has closed my file? With your help, am I guaranteed a higher settlement? Can’t my agent make sure I get a fair settlement from the Insurance company? Will hiring a Public Adjuster cause delays? What areas does Elite Public Adjusters cover? A certified Public Adjuster is licensed by the Department of Insurance to work for YOU, the insured. We negotiate with your insurance company with YOUR best interests in mind, not the insurance company. What does this mean? It means that more often than not, you'll receive a higher settlement by hiring the experts at Elite Public Adjusting. Insurance claims of all types (flood, homeowners, wind, business, etc.) are difficult and complex. Proof and documentation of damages is the responsibility of you the policyholder, not the insurance company. In addition, much of your home's damage may not always be visible through a quick exterior inspection. Some damage — like water, mold, smoke and fire — will lead to severe problems inside your walls that you may never see, let alone be able to prove and document to the acceptance of your insurance company. That's where our team of experienced adjusters comes in. We've seen just about everything and are highly trained at noticing all the fine details so that nothing is overlooked in the process of appraising value, estimating the true costs to repair and replace, and evaluating your loss. Insurance companies may not always offer you a fair settlement. With an Elite Public Adjuster working on your side, you can rest easy knowing that you've exhausted all of your options and have an even playing field when negotiating with your insurance company. Remember, insurance companies make their money by trying to NOT pay settlements, so a larger settlement will almost always be gained with the use of a licensed Public Adjuster at Elite Public Adjusters. If there is no recovery there is no fee for our services so you have absolutely NOTHING to lose and EVERYTHING to gain. Your insurance company will send an adjuster that they've hand selected to save them as much money as possible. Insurance companies have a Board and shareholders to answer to for profits and growth. As a Public Adjuster, we work for you, the policyholder and are paid from the additional funds we secure you in your insurance settlement. The insurance company’s adjuster must answer to their employer and will not have your best interests in mind when preparing a claim. The adjuster that is sent from your insurance company may not have the experience necessary to diagnose issues and damage behind your walls, find mold spores or even provide an accurate estimation of the true costs of home repairs. 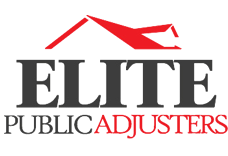 The certified adjusters at Elite Public Adjusting has decades of experience in the insurance AND construction industries and we offer a true and accurate estimation on what it will cost to get your home, and life, back to normal. Absolutely. We will be glad to provide a Claim Audit completely free of charge if you do not think your settlement was correct or accurate. This is a very common occurrence, especially when policy holders start receiving estimates to repair the damage in and around their homes. Remember, there is no charge unless you receive more money, so you have everything to gain and nothing to lose. There is ZERO upfront cost or out of pocket expense for any of our services at Elite Public Adjusters. Our fee is based on a percentage of the settlement from the insurance company and you will almost ALWAYS receive a substantially higher settlement with our adjusters working on your behalf. This means that not only do we not get paid unless you get paid, but you'll get paid MORE by hiring the professionals at Elite Public Adjusters. It has been shown that most inventories and estimates created by policyholders or company adjusters can be inaccurate or incomplete. By using our room-by-room checklists and advanced estimating software, we are able to provide comprehensive and accurate estimates, maximizing your claim. Many insurance companies will submit a low-ball offer first since many homeowners don't realize they can negotiate the settlement. Armed with our comprehensive estimates and thorough checks, we able to provide a maximum amount of negotiating leverage when going back and forth with the insurance company, working to get you the maximum and fair settlement you are entitled to. Insurance agents are salespeople. Often they do not have the responsibility or ability to handle insurance adjustments. Your agent can actually receive a bonus if your claim and those of others are kept small. Often the insurance company will ask that the agent not participate in the process since they do not possess the State Certifications that are required of Public Adjusters. Your agents main focus is to SELL insurance, not submit claims. Our main focus is to get you the fair and accurate settlement that you are owed. One simple phone call to Elite Public Adjusters is all it takes to get you the peace of mind, and insurance settlement, that you're looking for. Not at all. By using Elite Public Adjusters, claims will often get settled quicker. We take aggressive actions to ensure that your claim is settled in a timely fashion. Once you contact us, we will provide a free on-site consultation, we'll inspect your property and policy, and then your work is done. We handle everything from top to bottom and from claim submission to acceptance. After wind, fire, smoke or water damage, you'll have enough to worry about making sure your family is safe and taken care of properly. The last thing you'll want to do is have the hassle and haggle of dealing with an insurance company. We'll not only get you the fair settlement that you deserve, you'll also get peace of mind knowing you're in good hands.